How to Recover Deleted Dropbox Files? Have you ever thought what will happen if your Dropbox folder is deleted from its location on your computer? If this is your issue then no need to panic because you can resolve it easily by going through this article. Dropbox folder is like any other folder present on your system hard drive. Whenever you save any data on Dropbox folder, it automatically gets synchronized online; so that you can access your saved folder from any device where Dropbox client application is installed. This application runs background and checks whether your files are synced or not. What happens if Dropbox files are erased? Dropbox files can be present anywhere on hard drive. Usually they will be saved on drive, where the operating system is located. If these files are unintentionally or purposefully deleted, then data synced to its cloud counterpart will also be removed. If you want to remove files without affecting the cloud storage then the only way is by disabling Dropbox app. What to do when Dropbox files are deleted? If either of these techniques fail to retrieve deleted files then is better to use prominent file recovery tool available online to bring back deleted Dropbox files with ease. 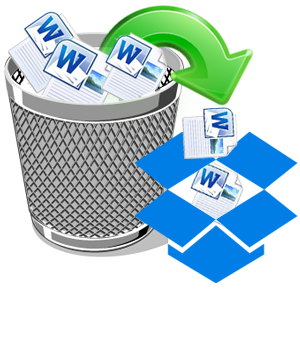 Yodot File Recovery application can effectively recover deleted Dropbox files from computers running on Windows Operating system. Its read-only algorithm will not alter the content of your original source file. Along with Dropbox files, it can easily recover documents, excel files, text files, PPT files, RAR files, basic media file types, PDFs, compressed files and many other files. It can retrieve deleted files on different versions of Windows operating system such as Windows 10, Windows 8, Windows 8.1, Windows Vista, Windows XP, Windows 7, Windows Server 2008 and Windows Server 2003. Its inbuilt advanced scanning technique can restore files from internal and external hard drive, thumb drive, SSD drives, memory card and so on. Not only deleted files, even data missing after disk cleanup process, formatting storage space, OS install or reinstallation etc can also be easily recovered with the aid of this robust utility. Using demo version of this file recovery, user can have a chance to verify recovered lost or erased files from Windows hard drive. If you are satisfied with output, then you can buy the product to activate 'Save Recovery Session' and save recovered files.